Chilli rating - spicy - 2. Popped, not fried. 97 calories per serving. Gluten free. No artificial anything. Suitable for vegetarians.Big crunch. Bold Flavour Hot? yes. Messy? no. This is a no-fry zone. Looking for something fried? Try your local chippy; you can get deep fried anything there. 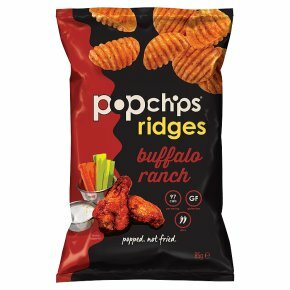 Looking for bold flavour and epic crunch? You've come to the right place! We take potatoes, add heat and pressure, then pop! You get crisps that are deeply satisfying, not deep fried.